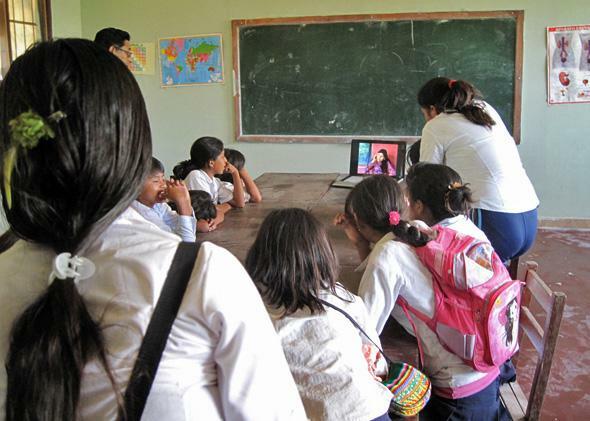 Developing countries and MOOCs: Online education could hurt national systems. Bolivian students in 2010. Can rising computer-teaching in developing countries enhance, rather than compete with, existing education systems? This article originally appeared in the New America Foundation’s Weekly Wonk. Future Tense is a partnership of Slate, New America, and Arizona State University. Time zones away from the quads of Cambridge, Mass., and Palo Alto, Calif., there’s a curious educational evolution happening. Though the modern massive open online course movement (MOOCs) originated in North America, two-thirds of their users live abroad—in places like Rwanda, China, and Brazil. In the United States—where public universities are hurting for funds, tuition and debt levels are growing, and graduation rates are stagnant—debate has focused on whether MOOCs represent a necessary innovation or the deplorable cheapening of elite university education. The question is: Could the hybrid, small-group model that’s evolving abroad also provide a needed alternative for underserved American students? The “open courseware” (OCW) movement commenced when MIT began putting bare-bones versions of its courses online, free to all, in 2001. The first generation of these materials were snoozers, consisting of little more than reading lists, problem sets, and occasional 45-minute lecture videos filmed C-SPAN–style from the back of a dimly lit lecture hall. Nevertheless, they drew millions of visitors. With crucial backing from the Hewlett Foundation and others, a global Open Courseware Consortium took shape, comprising hundreds of institutions worldwide that shared and published open textbooks and other resources. YouTube and broadband inaugurated the era of OCW 2.0. In the fall of 2011, free online courses on artificial intelligence and machine learning taught by Stanford University professors drew more than 100,000 signups each, and the term MOOC entered the popular lexicon. Today, the major MOOC platforms are the nonprofit edX, supported by a consortium of universities led by MIT and Harvard; and the for-profits Coursera, launched by Stanford professors Andrew Ng and Daphne Koller, and Udacity, launched by Stanfordite and Googler Sebastian Thrun. Each platform offers hundreds of courses in partnership with dozens of prestigious institutions. MOOCs follow a rough template of short video lecture chunks, readings, and assignments, some of which are automatically graded. Other assignments are assessed through a process of “calibrated peer review.” Discussion forums may be moderated by a teaching assistant or peer moderator, but largely the participants are left to their own devices. In Rwanda: Kepler University, seeded by the nonprofit Generation Rwanda, started this fall. Students will live together and complete a bachelor’s degree program based on MOOC material and accredited by a U.S. university. Online learning will be combined with intensive seminar-style learning, coaching, advising, and preparation for employment. Spire is a similar attempt currently in development in Kenya. In India: Jaaga, a business incubator and arts center built on a piece of reclaimed land in downtown Bangalore, one of India’s tech centers. It is piloting a one-year program with the goal of creating market-ready computer programmers. Students will work their way through MOOCs with the help of both volunteer nonexpert facilitators and online expert mentors from around the world. In El Salvador: Carlos Martinez, a professor of electrical engineering at the University of El Salvador, signed up 50 students—about one-tenth of his school’s electrical engineering majors—to take the edX version of MIT’s class on circuits and electronics in the fall of 2012. Informally and outside his classroom duties, he communicated with students on Facebook and set up discussion sections in a hallway once a week. Around the world: U.S. embassies in more than 40 countries are hosting weekly discussions for students enrolled in single MOOCs in partnership with Coursera. Embassy employees and Fulbright fellows host the free “MOOC Camp” sessions. Sites include India, China, Bolivia, and topics include English, science, technology, engineering, business, and U.S. government and politics. All of this activity aimed at extending access to learning is encouraging, but it’s important not to be so carried away by techno-exuberance that we lose sight of some of the potential opportunity costs involved. The danger in overreliance on global MOOCs is that they don’t build local capacity for education, research or knowledge creation in the education sector. For example, Kepler, a U.S.-based endeavor, announced its intention to offer an education superior to any available at a Rwandan university for a lower cost. This may benefit a small group of Rwandans in the short term, but it does not assist President Paul Kagame’s struggle to improve education and technology in that country over the long term. It’s easy to imagine a future in which the educational equivalent of reruns of Baywatch—a limited menu of glossy American fare—comes to dominate the cultural landscape in developing countries around the world, making it more difficult for cash-starved universities in those countries to pursue scholarship relevant to local contexts. This potential undermining of local education becomes especially problematic when the U.S. government takes an official role in promoting the use of MOOCs as a form of public diplomacy. The trick going forward is to figure out how MOOCs can enhance, instead of just compete with, existing national education systems. It’s hard to argue with the benefits of exposing ambitious, bright people around the world to cutting-edge areas in computer science, say, or business-plan writing as it is taught at Wharton. Research shows that blended learning, combining face-to-face contact with online work, is generally superior to either mode used alone. The emergence of ultra-affordable blended-learning degree alternatives based on free online resources just might be the “leapfrog” solution that allows nations full of undereducated young people to move into the middle classes. And that brings us back to the United States, where student loan debt has topped $1.2 trillion. Bill Gates, for one, has endorsed the notion that MOOCs be adopted as a way of enhancing the curriculum at cash-strapped community colleges, and 10 U.S. state university systems have announced that they will be using the Coursera platform to share resources among their institutions. But what we haven’t seen so far is a lightweight, ultra-low-cost model that combines in-person mentoring and support with digital educational materials created at elite institutions. Is it time to reimport an educational model from Bangalore back home to Buffalo?